Selected by Microwaves&RF’s Chris DeMartino as a top product of 2017, the AWA-0134 further enables the roll-out of mmW 5G systems. 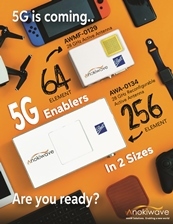 San Diego CA, 6 December, 2017: Anokiwave, Inc., an innovative company providing highly integrated IC solutions for mmW markets and Active Antenna based solutions, today announced its 256-element mmW Active Antenna Innovator’s Kit, the AWA-0134, has been listed as one of the top products of 2017 by Microwaves&RF. Developed with Ball Aerospace for mmW 5G wireless markets, the AWA-0134 is a 28 GHz, 256-element, reconfigurable active electronically scanned antenna for 5G mm-wave communication applications. The AWA-0134 represents the first commercially available 256-element Active Antenna at 28 GHz to enable the development and measurement of radio links and channel models, as well as for rapid prototyping and testing of electronically beam-steered radio links through low-latency beam update rates. The Active Antenna is driven by the Anokiwave AWMF-0108 28GHz 5G Quad Core IC with embedded functions for remote telemetry and low-latency beam steering™. The Microwaves&RF article, dated November 30, 2017 may be found at the following link: top-products-2017.